Combine water and wheat berries in medium saucepan. Bring to a boil. Reduce heat and simmer, covered, about 1 hour or until wheat berries are tender. Drain off any water. Place wheat berries in large bowl; cover and refrigerate at least 1 hour. To prepare salad dressing, whisk together vinegar, olive oil, honey, and fennel seeds, if desired, in small bowl. 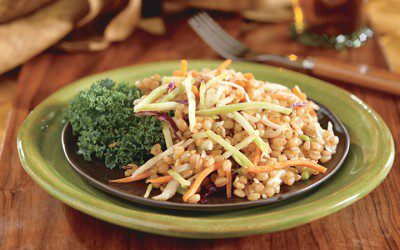 Add cole slaw mix to wheat berries. Drizzle with dressing; toss until coated. Serve immediately. Tip: For a more colorful salad, choose a coleslaw mixture that contains both green and red cabbage. Exchanges per serving: 1/2 Bread/Starch, 1/2 Fat, 1 Vegetable.